eScienceCommons: Are hugs the new drugs? Research is showing that compassion meditation -- focused, warm thoughts about yourself and others -- may have positive effects on both your mental and physical well-being. Basic empathy is a biological given. “If you talk with a sad person, you are going to adopt a sad posture, and if you talk to a happy person, by the end you will probably be laughing,” said Emory primatologist Frans de Waal. He explained that evolution has programmed us to mirror both the physical and emotional states of others. De Waal gave the opening remarks at a conference bringing together the Dalai Lama and scientists studying effects of compassion meditation on the brain, physical health and behavior. In order to get from empathy to compassion and altruism, you need to identify others as distinct from you. While it used to be assumed that altruistic tendencies were only possible in humans, de Waal said that targeted helping of others has recently been observed among apes and elephants. 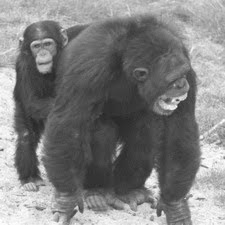 Photo by Frans de Waal shows a young chimpanzee consoling an adult male that just lost a fight. Richard Davidson, a neuroscientist from the University of Wisconsin, recalled when he first began studying the effects of compassion meditation in 1992. He traveled to a Tibetan Buddhist monastery and attached electrodes to the head of an expert practitioner. The other monks began laughing. “I thought it was because he looked so funny with the electrodes,” Davidson said. But it turned out the monks were amused that he was trying to study the effects of compassion by attaching electrodes to the practitioner’s head, rather than to his heart. Years later, Davidson is finding that the monks’ view may be on target. New research shows that the heart rates of expert practitioners beat more quickly while they are meditating than the hearts of novices. 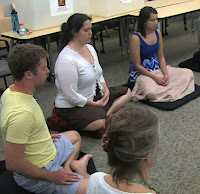 “We believe that compassion meditation is facilitating communication between the heart and the mind,” Davidson said. Psychologist Barbara Fredrickson at the University of North Carolina-Chapel Hill cited her research into the effects of “love and kindness meditation,” or LKM, on the vagus nerve. The nerve, which extends from the brain stem to the heart, helps regulate emotions and bodily systems. The effectiveness of the vagus nerve is measured by its tone, or fitness. The higher the vagal tone, the better the vagus nerve performs as a regulatory pathway. Emory researchers Charles Raison and Geshe Lobsang Tenzin Negi described their ongoing research into the effects of compassion meditation and depression. Negi developed a secular form of meditation for the research, based on the Tibetan Buddhist practice called “lojong.” Lojong uses an analytical approach to challenge a person’s thoughts and emotions toward other people, with the long-term goal of developing altruistic behavior. The pair collaborated on a 2005 study that showed that college students who regularly practice compassion meditation had a significant reduction in stress and physical responses to stress. They recently launched the Compassion and Attention Longitudinal Meditation Study (CALM), to explore the physical effects of different forms of meditation. “We’re trying to zero in on what is it about meditation that is useful for people’s health,” Raison said. Emory researchers are also getting positive preliminary results in compassion meditation studies involving schoolchildren ages six to eight and adolescents in the foster care system.